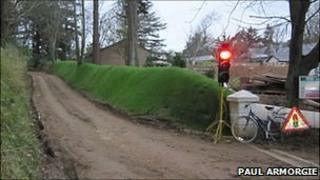 Sark's first ever set of temporary traffic lights have proved too fast for tractors, the only motorised vehicles allowed on the island. The lights were put in place last week to control traffic on Dixcart Lane. However, the lights did not enough allow enough time for drivers to make the journey so have been replaced. Conseiller Paul Armorgie said: "This caused anger and frustration amongst Sark tractor drivers and even an isolated incident of 'tractor rage'." Mr Armorgie said the original lights were on green for a maximum of 50 seconds - in accordance with UK legal requirements. He added: "However, Sark only has farm tractors and 50 seconds did not allow sufficient time for each tractor to pass safely along the narrow lane before the lights changed colour." The new lights, which would not be legal in the UK, allow for a maximum setting of up to three minutes between each red light. Mr Armorgie said: "This goes to prove that the pace of life on Sark is definitely slower than the rest of the world." Dixcart Lane, a 500m narrow road, has two blind corners and has seen an increase of traffic as it is the only road access to two hotels, both of which are undergoing renovation work. The lights are due to stay in place until February.